Some birds you might take for granted, others might make you take more notice when you see them. The Masked Biologist reports a shrike sighting in this week’s Wildlife Matters. I saw a shrike a couple of weeks ago. I was driving from somewhere to somewhere else, alone, and I was slowing down for some kind of lane closure and I saw a shrike sitting on a sign. Big deal, right? To those of you listening that aren’t birders, you might not be familiar with shrikes. They are in an interesting category of bird, the predatory songbird. And, you may not be aware, but they are not terribly common to observe here in Wisconsin—but if you see one, it is most likely to happen in winter. The shrike, or butcherbird as it is sometimes called, hunts prey its own size or smaller, including insects, rodents, small birds amphibians, snakes, and the like. The butcher in their name comes from their seemingly peculiar habit of storing some of its prey by spearing it on sharp branches or barbed wire fencing. It was always thought they were storing food for later, but in some cases storing their prey can help break down body chemicals that make them unpalatable (such as monarch butterflies). This bird isn’t extremely large, I guess I would say its generally the size of a smaller robin but more chunky or blocky. It has a black bill curved slightly downward, is mostly gray with black markings and a striking black eye line. That’s how I knew I saw a shrike. There are a couple of birds that look somewhat similar, but they migrate out of the area and their markings aren’t quite as striking. The question I struggle with is what kind of shrike was it. You might think it was a loggerhead shrike. We do have a few of them here in Wisconsin, according to the first Wisconsin Breeding Bird Atlas, but they are listed as endangered here. Frankly, they don’t seem too likely to breed up in this area, given their preference for more open habitat like old overgrown fields with shrub edges and old fence rows. Also, these birds tend to migrate out of the area in winter. I’m more inclined to think I actually saw a Northern shrike. If you know anything about bird species, you may know that ornithologists love to classify and re-classify birds. For example, the Baltimore Oriole and Bullock’s Oriole were reclassified into one species, the Northern Oriole, but then in the ‘90s they were split back apart and the Baltimore Oriole returned. 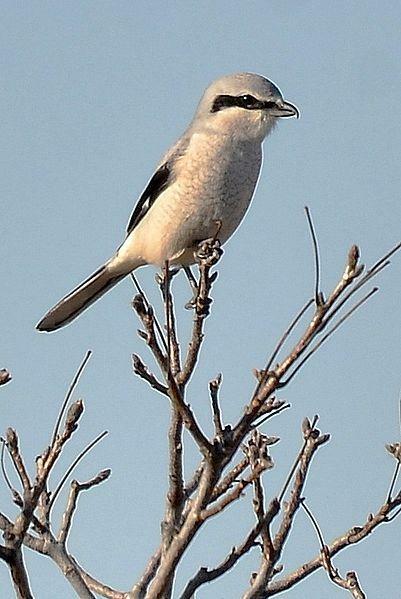 Somewhat similarly, the Northern shrike used to be considered a subspecies of the great gray shrike, but is now considered its own separate subspecies. Unlike the loggerhead, which is only found in North America, the Northern Shrike can be found in Siberia as well as northern North America. In fact, this bird breeds up in the Arctic and subarctic of Canada, and will migrate down into Wisconsin to escape cold, snowy winters. From what I can tell through my research, the Northern shrike is faring much better than the Loggerhead shrike. Why would that be? Two birds, similar subspecies, overlapping geographic ranges, similar or identical diets, one seemingly doing well and another experiencing dramatic population declines across its range? Well, its easy to point at climate change at a time like this, but rarely in my mind is one answer the solution. I fear we would need to more closely examine food and habitat for this bird. Small family farms have all but disappeared from the landscape, and with them the shrub rows, brushy fencelines, and small overgrown pastures needed for these birds. The food is also a source of concern. From what I recall seeing in other Midwestern states, a large part of their summer diet (and what they feed to their young) includes grasshoppers, which are often sprayed with neurotoxins in intensive farming communities. Maybe as we become more aware of the use of insecticides and their negative impacts on the food web, these birds and others will benefit and thrive once again. The photo used above can be found on Wikimedia Commons here. Wisc. Dept. of Natural Resources. How are you coping with the cold weather this winter? Wildlife species generally have three options as the Masked Biologist notes in this week’s Wildlife Matters.